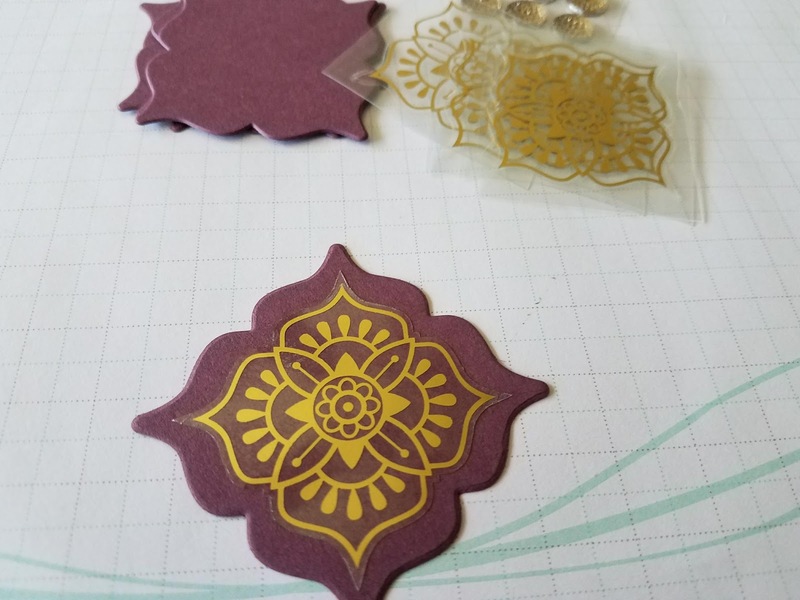 For tonight's card, using the Eastern Palace Suite, I created a design that uses DSP that reminds me of a Peacock. First I selected one of our beautiful new cardstock In-Color bases called Fresh Fig. 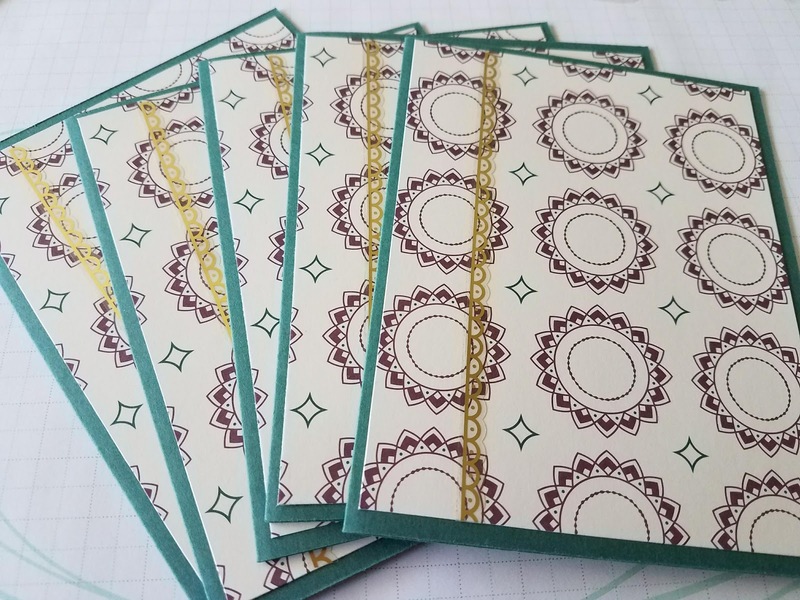 I cut them 5 1/2 x 4 1/4 giving the perfect base A2 card and used the bone folder to create crisp creases right down the middle. 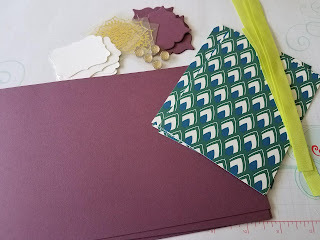 I also choose a piece of DSP from the Eastern Palace Specialty DSP that really pops with this beautiful color cardstock. After cutting this down into 4x5 1/4 pieces I added adhesive to the back and added a beautiful piece of our new Lemon Lime Twist ribbon. 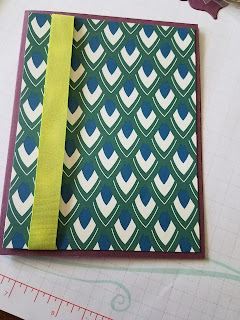 Then I adhered the DSP to the card base. 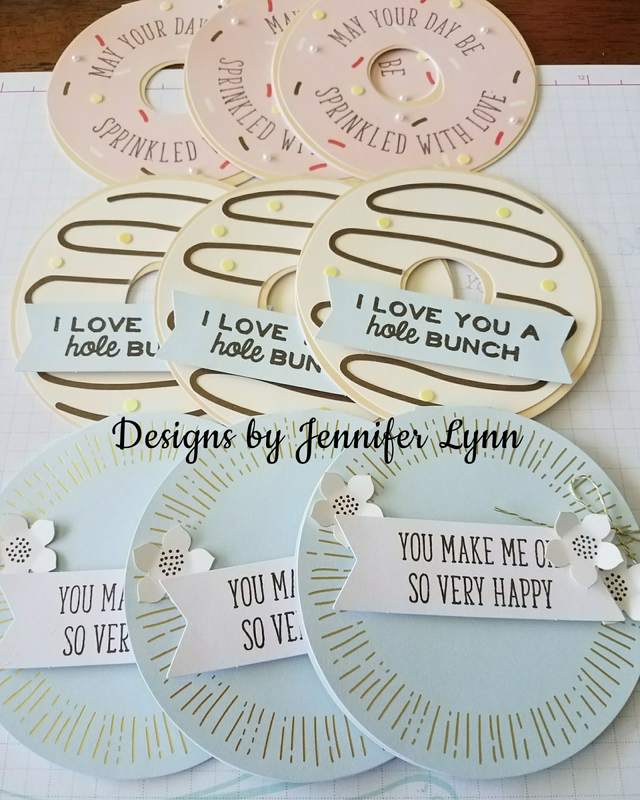 Next I stamped sentiments on the cute punched art pieces that would later be adhered to the card front. 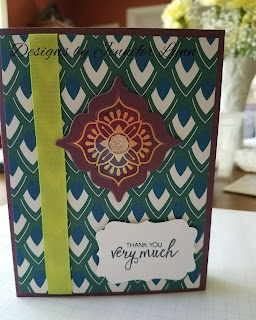 I then added stampin' dimensionals to the back of the sentiments. 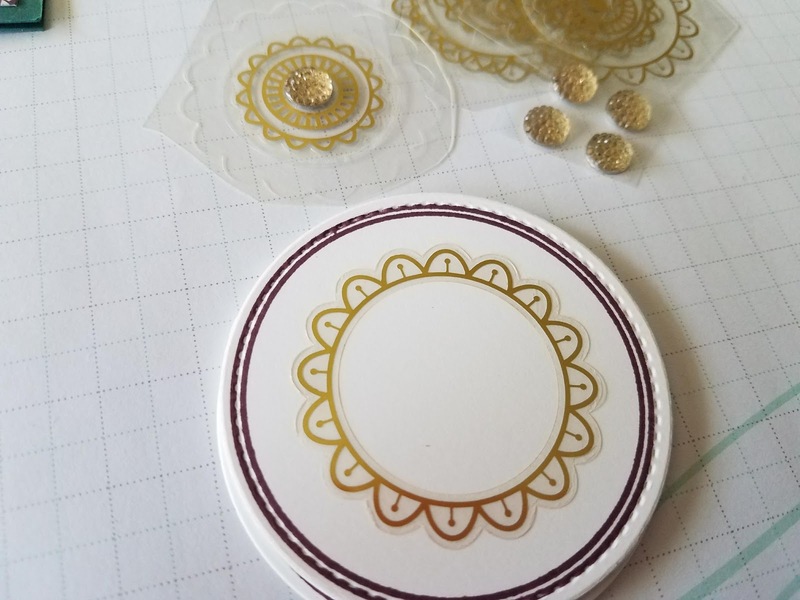 The next step was to use some of the beautiful sticker elements from our awesome gold foil stickers, as well as our beautiful gold facet gems. 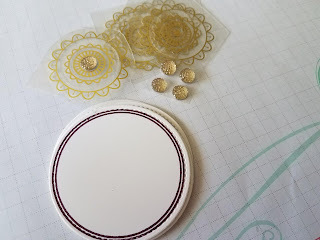 First you will adhere the sticker to the center of the medallion that is created using our great Eastern framelits from within the bundle. Next you add the gold facet gem to your medallion. 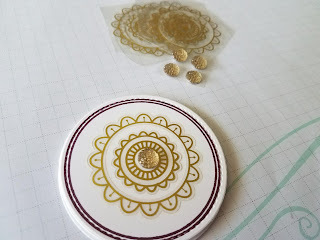 After your medallions are all set you will add some dimensionals to the back of the medallions. 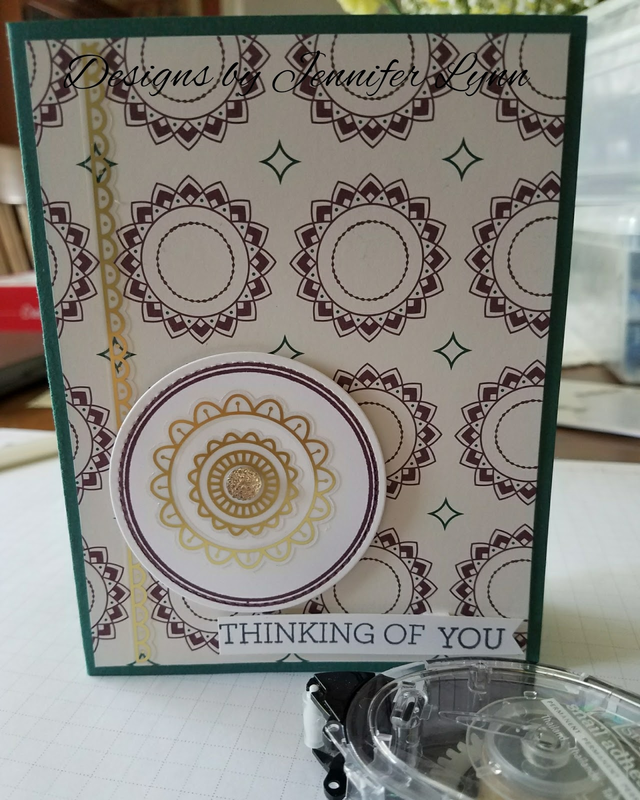 When this piece is all set, you will adhere your sentiment and medallion to the front and you will have a beautiful card ready to thank anyone you need to. 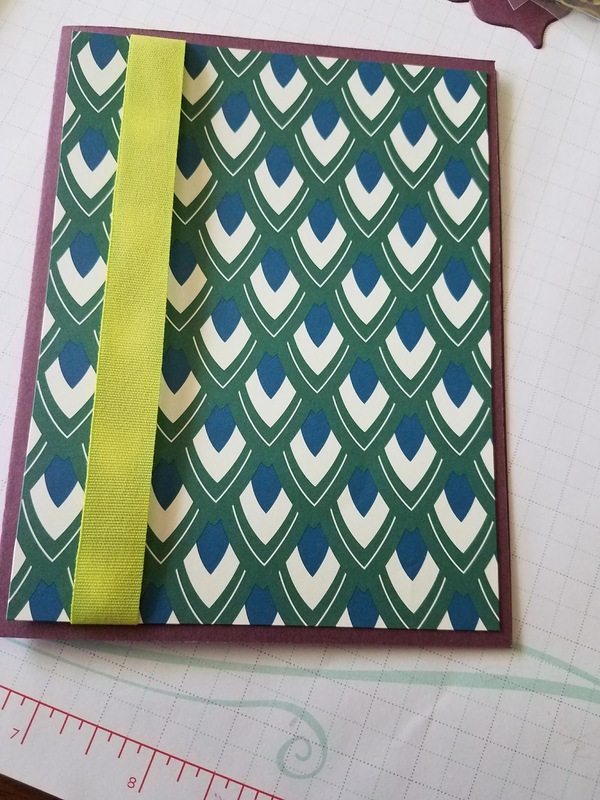 I hope you enjoyed this design. 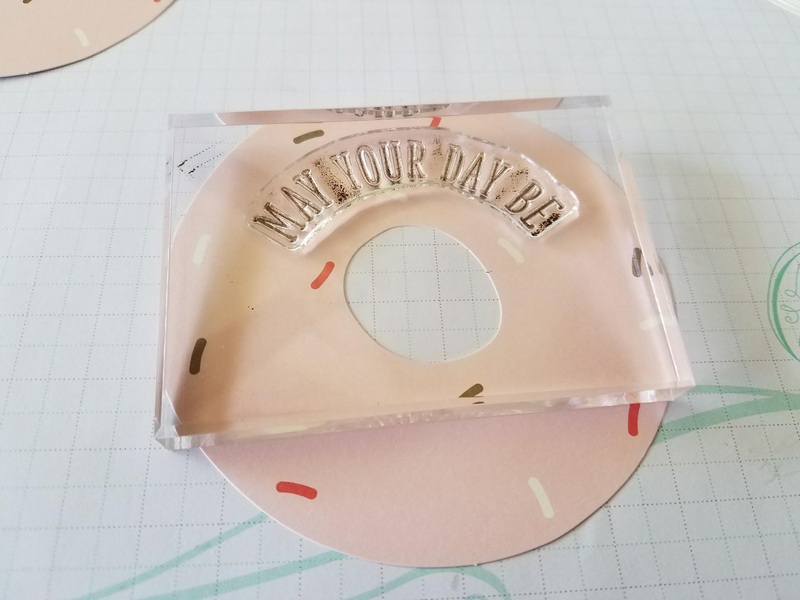 Please come back Thursday for another design and more information on how to order one of the two bundles using these products. 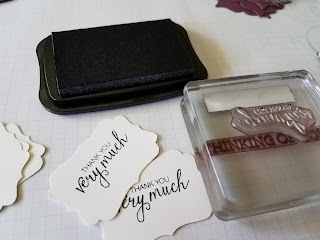 When it comes to subscriptions I like to think Stampin' Up! 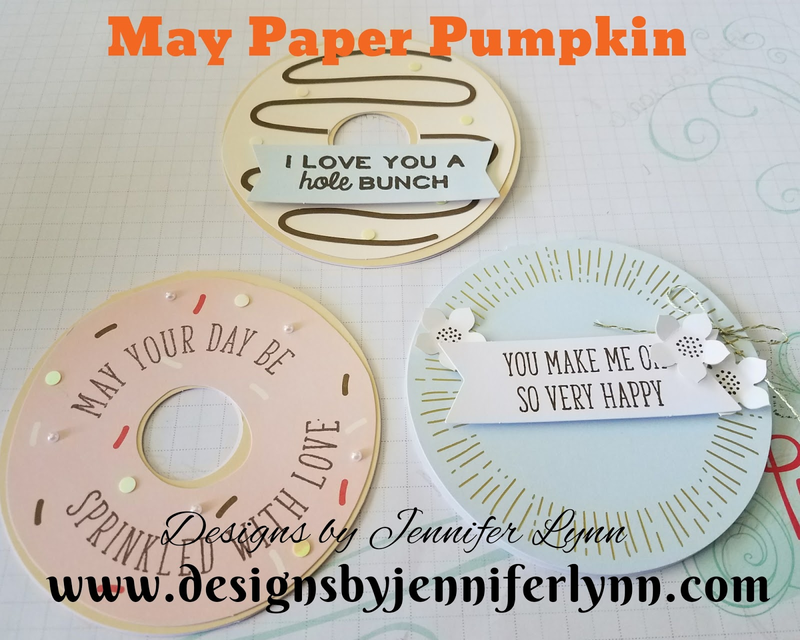 's My Paper Pumpkin is one of the best and this month they did not disappoint at all. 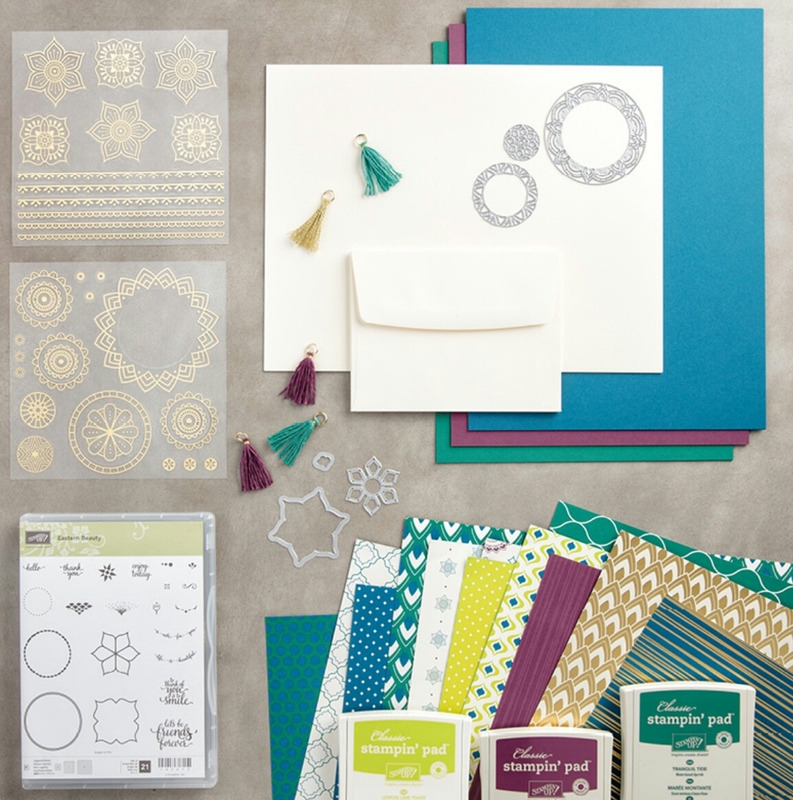 After last month's awesome kit created by our very own CEO, this month was equaling appealing. This kit has so many items there was plenty of product left over for alternative ideas. 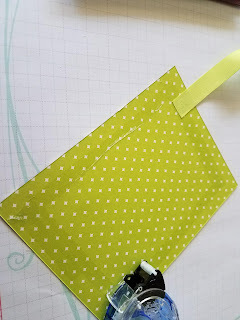 I will have more with those ideas on Wednesday May 24th for you. 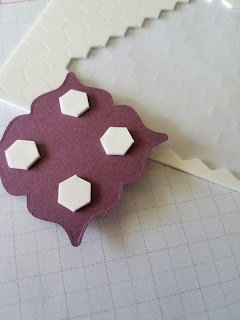 Above you see complete step by step instructions on how to create the exact project ideas within the kit. Very easy and visually helpful. When you sign-up for a paper pumpkin subscription your first kit will also include a clear acrylic block for use of any stamps that come in your kit or future kits. As you can see below these are the three exact cards created by instruction from the directions in the kit. 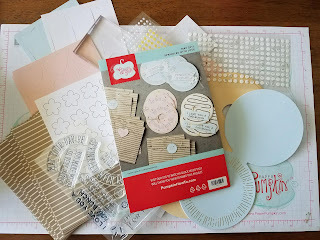 I can't wait to share some additional ideas with you all later this week. 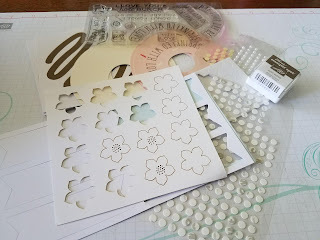 As you can see here there are a number of supplies left over for additional projects. 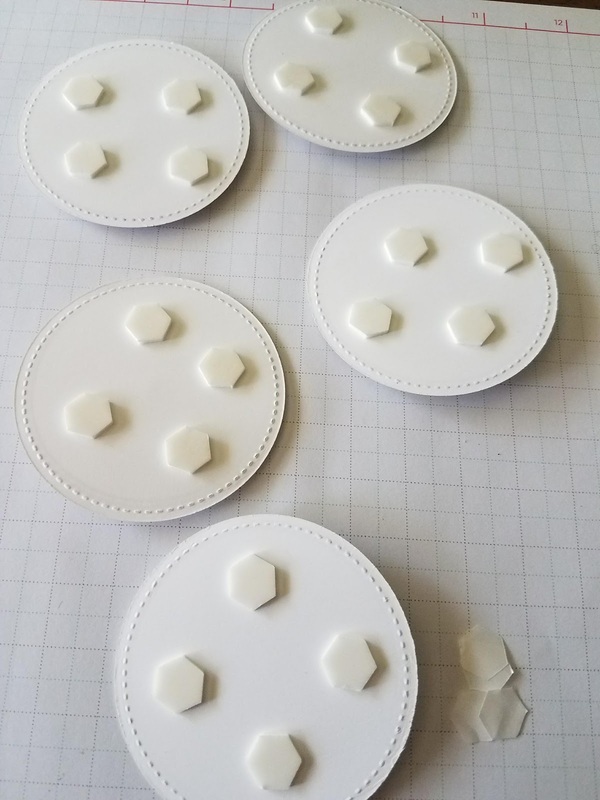 Following the instructions exactly, created enough for 9 cards with envelopes. If you are interested in trying My Paper Pumpkin you can Click Here and sign-up for a month. There is no obligation and you can even skip a month if you need to. If you want to do more then one month consider purchasing a 3, 6, or 12 month subscription. Feel free to contact me with any questions. 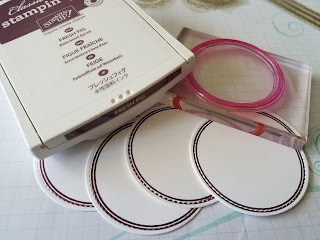 Happy stamping!! 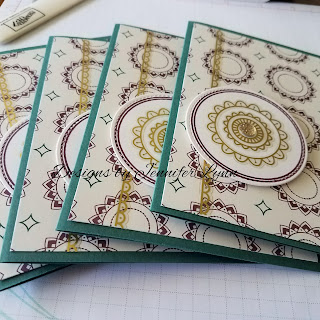 I had so much fun creating some amazing cards for a special class and received such great feedback about this awesome Eastern Palace bundle I wanted to do something special to help anyone who is on the fence about taking advantage of this bundle before the sale is done May 31st. 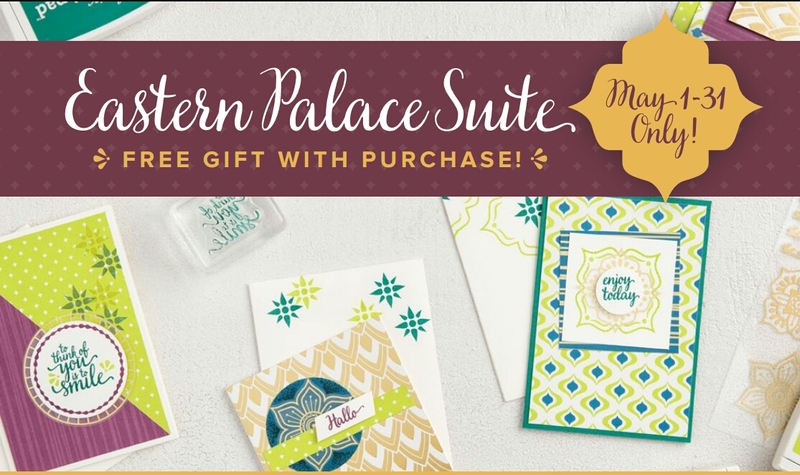 We start the week with a beautiful card that looks complex, but comes together very nicely with pieces from the Eastern Palace Suite Bundle. First I selected one of our beautiful new cardstock In-Color bases called Tranquil Tide. 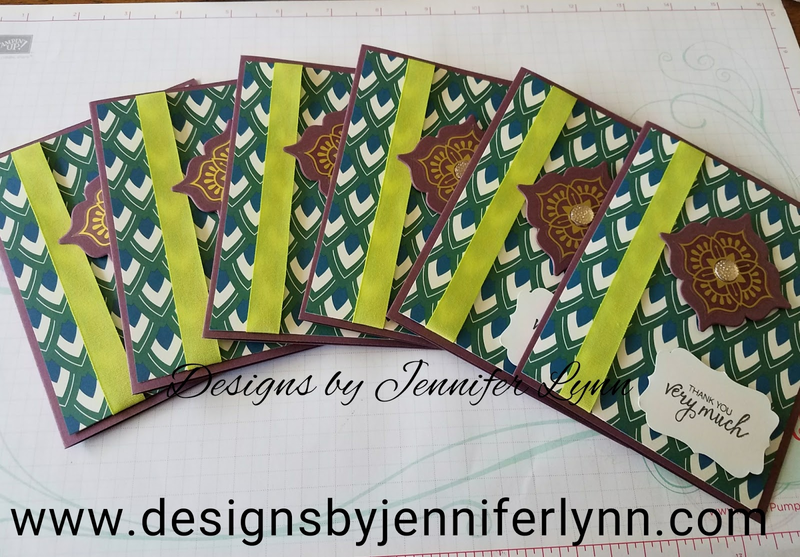 I cut them 5 1/2 x 4 1/4 giving the perfect base A2 card and used the bone folder to create crisp creases right down the middle. 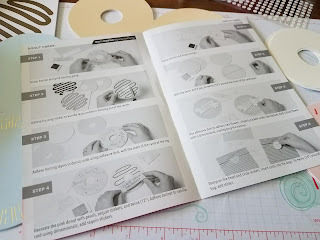 Next I cut out circles using our awesome Stitched Shape Framelits that will be available in our new catalog June 1st. 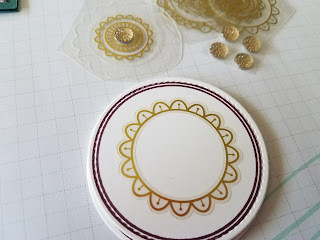 Once cut I took the circle outline stamp from the Eastern Beauty stamp set, and used our Fresh Fig new In-Color ink to create beautiful rings around the outside of the circles. 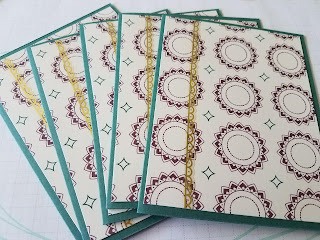 Next I cut a sheet of the Eastern Palace Designer Series Speciality Paper (DSP) into sections to make the perfect card fronts for my card. If you cut these 4 x 5 1/4 you will have the perfect mat base and have very little left over from the one sheet. 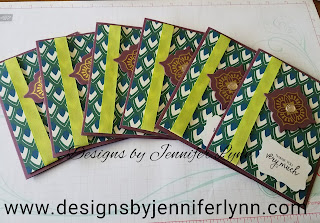 You can get 6 card fronts from just one sheet of DSP. I then took these card fronts and adhered them to the card base and added a pretty gold sticker from the amazing new gold foil stickers in this bundle. 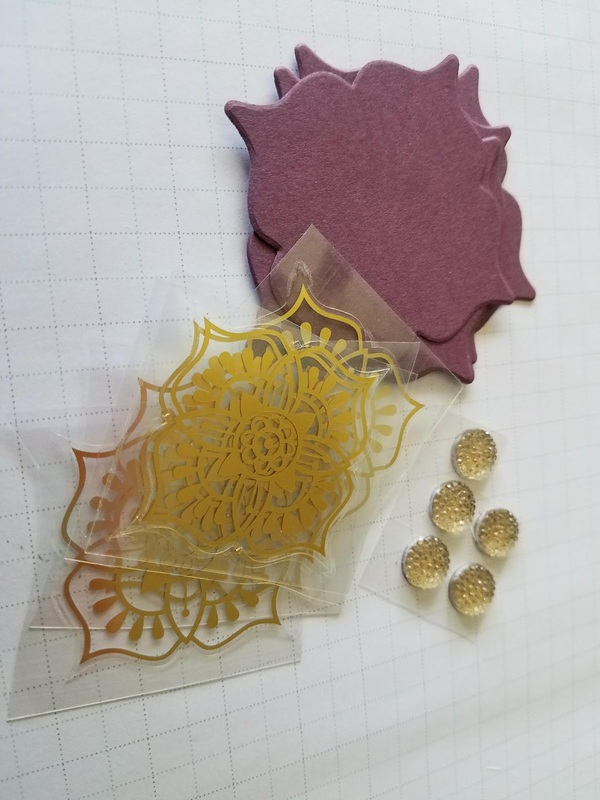 The designs are amazing. 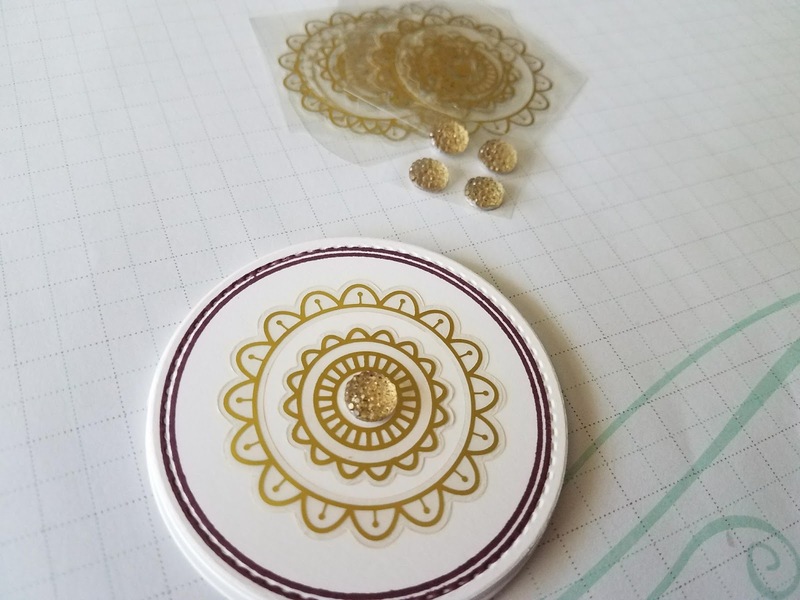 After this was all set I took one of the circle designs that is a two part sticker gold foil element, and added it to the center. 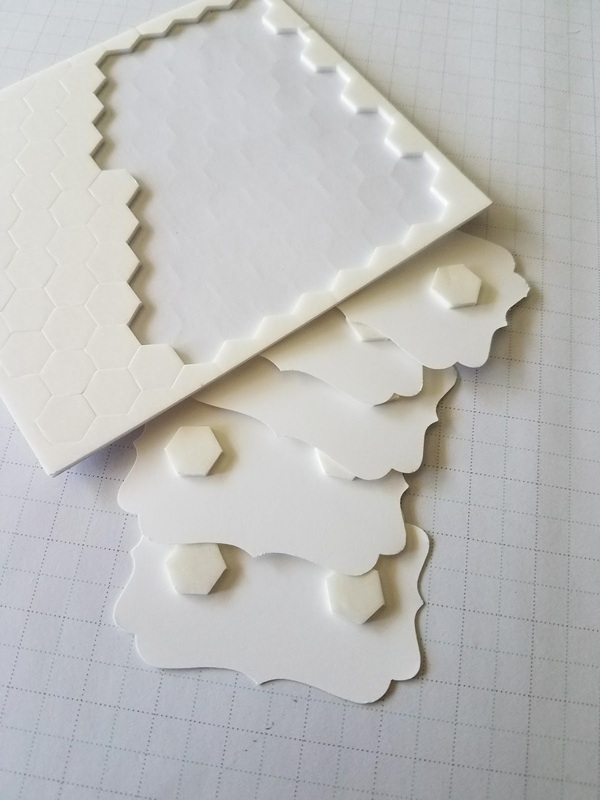 This sticker has two pieces so you can use it together or on separate projects. 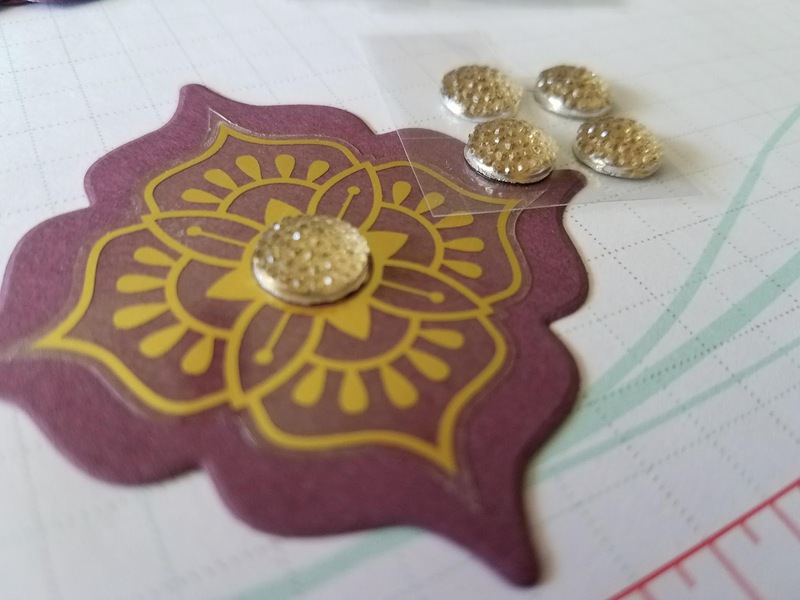 To add a touch of bling to the card, and to take a "fab" card to "fabulous", I used the beautiful Gold Faceted Gems coming out in the new catalog. 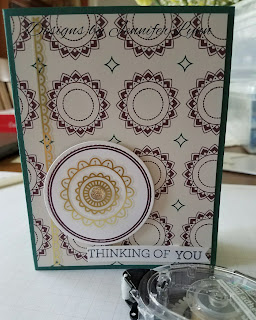 Once these were assembled I added stampin' dimensionals to the back of the circles, adhered them to the front of the card and added a cute Thinking of You sentiment with Basic Black Ink, our Crazy About You retiring stamp set, and the fun banner punch to give one end a look of a pennant. 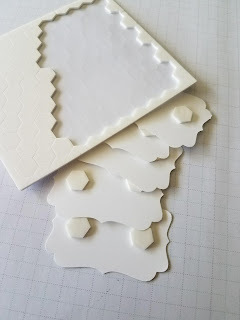 I hope you enjoyed this simple tutorial and design. 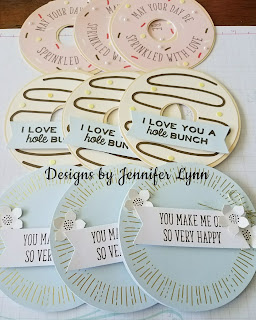 Please stop back each day this week in the afternoon to check out a different design created using the amazing Eastern Bundle Suite supplies with a few add-on's. Thank you and have a great day! 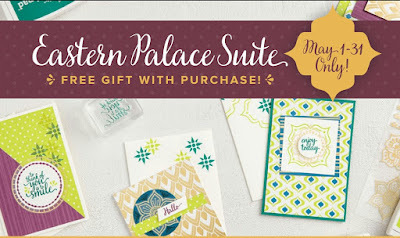 LOOK ...The NEW Eastern Palace Suite IS HERE!!!! Hi everyone. IT'S HERE....IT'S HERE....IT'S HERE!!! 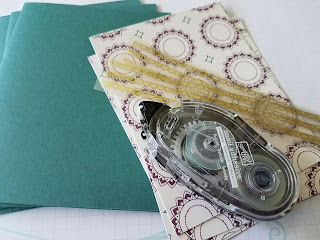 As you know the New Annual Stampin' Up! catalog will be full of amazing products and you will get to start purchasing from this catty as of June 1st. You will definitely NOT be disappointed!! However, Stampin' Up! has outdone themselves again! 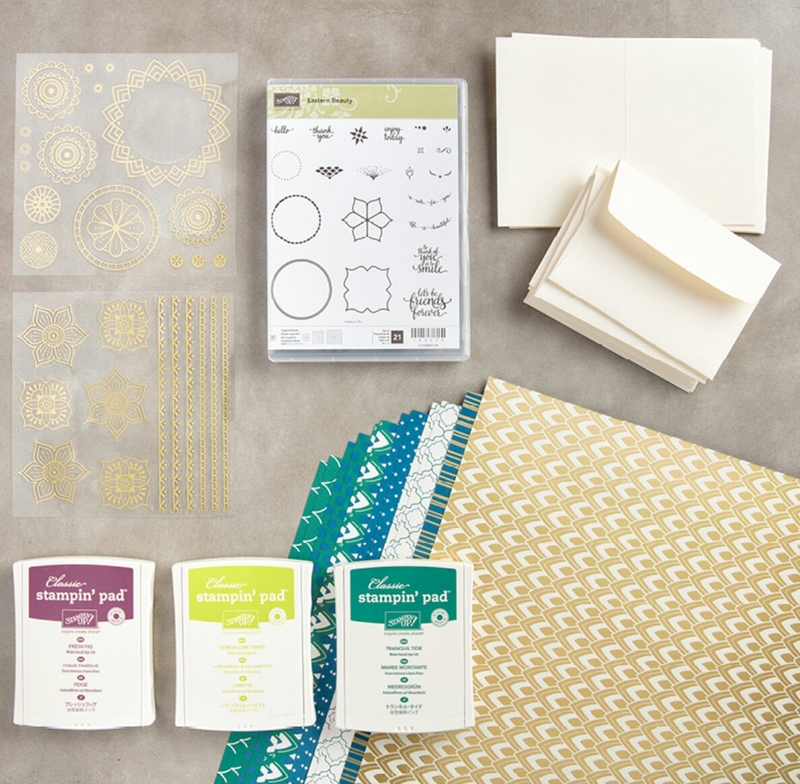 From May 1st through May 31st customers may take advantage of a special Early Release of New Products with two exclusive bundle options. With this option you will receive stamps, designer series paper, gold window style stickers ...(I have a special trick to turning them silver) ... and 3 new In-Color ink pads.You'll also receive Very Vanilla Notecards & Envelopes as a FREE GIFT! This includes the Basic Bundle products but also includes: coordinating dies, cute Mini Tassels, cardstock, and as your FREE gifts you receive, a pack of NEW Very Vanilla Thick A4 cardstock and Very Vanilla Envelopes. So what is the catch you might ask? 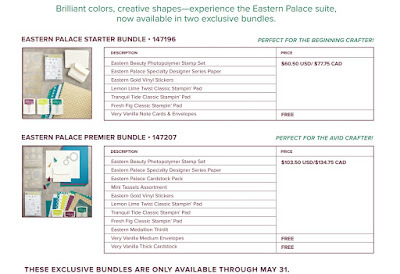 There is no catch BUT I must note these bundles are offered ONLY from May 1st through May 31st. 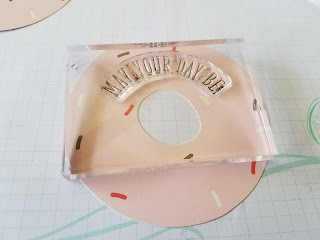 Once June 1st comes, you can definitely ordered these amazing products, BUT they will be only offered as singles items in the new catalog. They will not be offered as bundles so you definitely want to take advantage of one of these awesome deals. 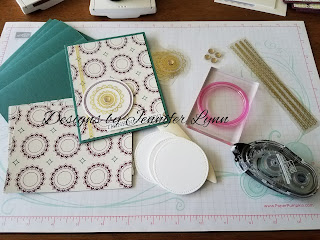 BONUS ALERT: Do you have a demonstrator? 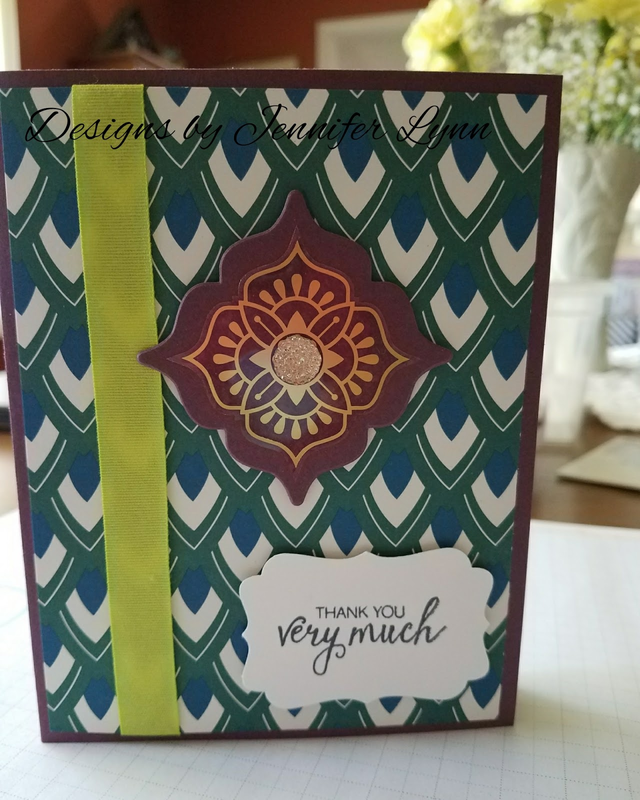 As an added bonus all my customers enjoy special customer appreciation events, handmade cards and free product, as well as fun filled classes as part of my customer service to you. I would LOVE to be your demonstrator. During this exclusive bundle deal, for the month of May 2017, if you purchase one of these bundles, you will have the option to enjoy a FREE class Live or Online, to help you get the most out of your bundles!!! 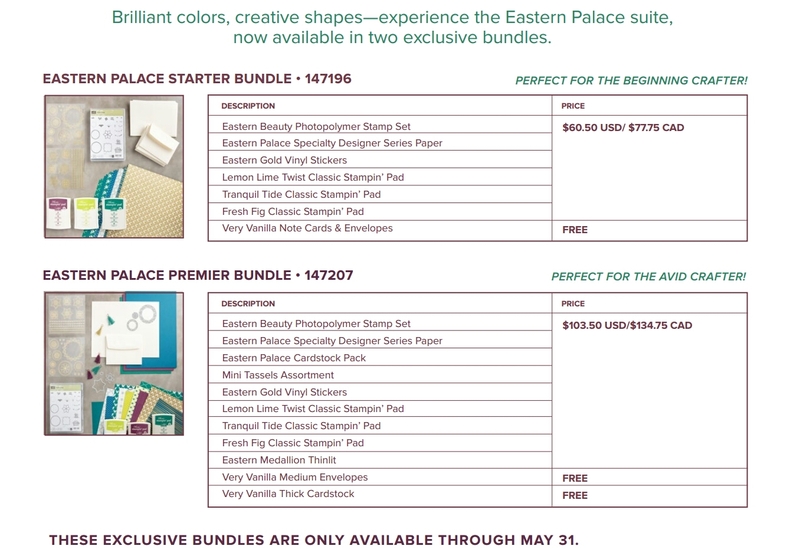 This is an exclusive offer for customers who purchase either the Basic or Advanced Eastern Palace Suite bundle options from May 1st through May 31st. Feel free to contact me with any questions you may have, and stay tuned for fun samples, suggestive additional items that will work well with these bundles, and what these bundles can do, throughout the month! !